This is a new and extensively updated edition of one of leading and authoritive books on the subject of IT costs and benefits. Since it was first published in the early 1990s, this book has established itself as the most comprehensive and complete approach to understanding the economics of how information is used to boost the efficiency or effectiveness of companies. The ideas in this book are used extensively in business, and the book is widely adopted and recommended at leading business schools around the world. 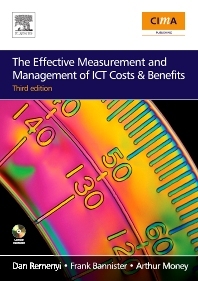 This book covers a wide spectrum of IT cost and benefit solutions, ranging from business case accounting and user satisfaction studies right through to the business processes which need to be in place in order to ensure the effective measurement and management of IT costs and benefits. This book takes you through a basic understanding of the issues involved and onto the detail of how to perform the techniques required to measure and thus mange IT costs and benefits. The rapidly increasing level of expenditure on information technology in most organisations is one reason why IT benefits management has become an important business concern. Top management have begun to insist that much more attention be paid to the economic aspects of information systems. New to the third edition: The evolution of thinking in ICT costs and benefits; management instinct; the chapter on Identification and Treatment of ICT costs is replaced with a more thorough treatment of the subject; the chapter on Risk Analysis is expanded by 50% with new and latest thinking on the subject; new chapters on: ICT evaluation as a political act, and the evaluation of an outsourcing contract. Extensive revisions of the material through out bring the book up-to-date with the latest thinking and evaluation techniques complete with a number of suggested websites through out the book where more information about the subject may be found. Accountants; Business Analysts; I.T. Managers; I.T. Directors; CEOs; CIOs. Why evaluate information technology; Aspects of the IT investment decision process; Issues and techniques for IT evaluation; IT cost control; IT business case accounting; Risk analysis; Value for money; Designing IT surveys for benefit measurement; Evaluation and project management; ICT evaluation; The evaluation of an outsourcing contract. Frank Bannister is a Senior Lecturer in Information Systems at Trinity College, Dublin. After graduating from university, he joined the Irish civil service and worked in operations research and economic policy for three years prior to joining Price Waterhouse as a management consultant in 1978. Over the following sixteen years to 1994, he worked with Price Waterhouse on a wide range of information systems assignments in Ireland, the U.K. and Europe in both the public and private sectors, specialising in financial modelling, system design & development and in system specification & selection. He remained a Consulting Associate with PricewaterhouseCoopers Consulting until their take-over by IBM in January 2003. In 1994 he moved to Trinity College where he is currently Director of Studies for the Management Science and Information Systems (MSISS) programme. His currently teaching responsibilities include strategic information systems and decision making and modelling. His research interests are in IT value and evaluation, IT acquisition as well as in e-government and e-democracy. Frank has written many articles on information technology and systems and has lectured extensively on these and related topics in Ireland and the UK.